For many men and women, unwanted hair can be a nightmare, and getting rid of it can be painful. Until now the only options for removing unwanted hair were smelly hair removal creams, sharp razors, stinging wax or painful electrolysis needles. The pulsed light hair removal system provides the ultimate solution. 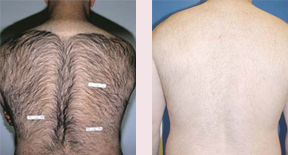 Now men and women alike will be pleased with the result made possible by the Pulsed Light Hair Removal Process. This revolutionary laser emits pulses of light into the hair follicles. The light is then absorbed by the pigment in the follicles and is converted into heat. The heat loosens and disables the cell responsible for present and future hair growth. Pulsed Light System offers a lasting solution for unwanted hair. Immediately after the treatment you can expect a mild sun-burn like sensation. That usually last 2–24 hours & can be soothed with cold gel or ice packs. The treated hair will continue to appear for 7–30 days post treatment. This is not new growth, but the treated hairs being expelled from the skin. At any time, some of your hair is not in the phase of active growth; therefore you will need more than that one treatment to effect the growth of all your unwanted hair. Typically, several treatments will be necessary to achieve permanent hair reduction.